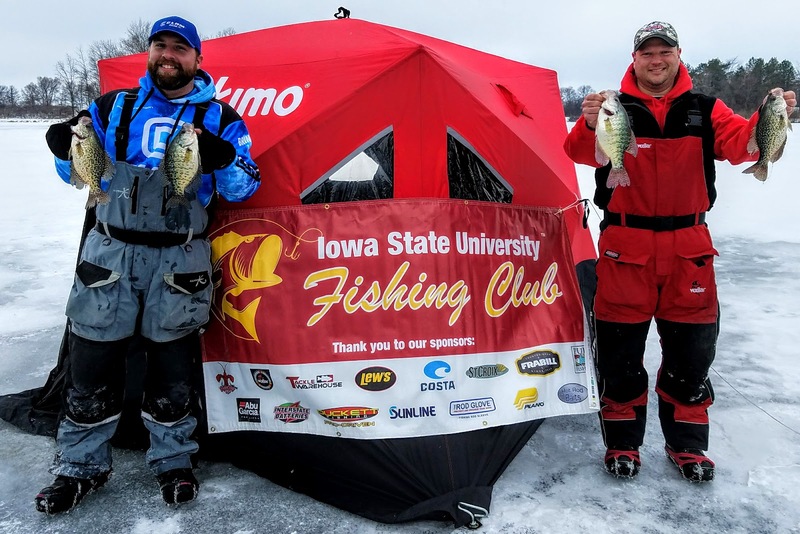 This weekend marked the annual Iowa State University Fishing Club Ice Tournament at Hickory Grove Lake. This college organization puts on a few open ice tournaments each year to help raise funds for their organization. This is an event that I have fished for many years, as I really enjoy fishing that body of water. The past couple of years have been a bit of a disappointment in terms of finishing high in the standings. This year, my partner Mark Anderson and I discussed it was time to "swing for the fences". The previous weekend Mark did the heavy lifting and scouted the lake from a new perspective. We focused our time before the tournament on trying different locations to try and find the roaming crappies that live in the lake. The numbers of crappies in the lake is not great, the bluegill population is as strong as it has ever been. Of course catching a few crappies makes a huge difference when you need to weigh in 10 fish for the tournament. 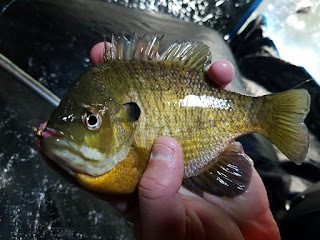 Don't get me wrong, the bluegills are of nice size in the lake, and plenty of keepers to go around, but when you are after the heaviest weight, crappies are the way to the top of the leaderboard. 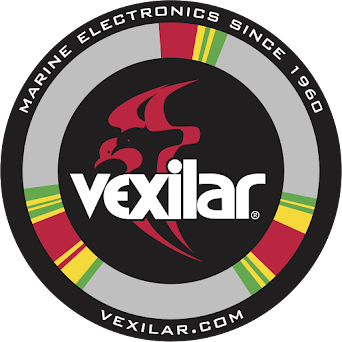 We found the crappies and fine tuned the cruising patterns before the the event using the trusty Vexilar FLX-28s, These units are nice to work with when finding fish. The cone angle of the Pro-View transducer lets you see a vast amount of water beneath the ice, making our job of finding fish easier. Could we count on the crappies to stay the course? Tournament day couldn't get here soon enough! With a bit of surprise the crappies did stay their course, and the size of them were even a little more than we expected. We were able to come away with dozens of fish on the day, and we did manage to get 10 crappies that took us to the top for the win. We also weighed in the largest fish of the tournament, a white crappie that weighed 1.14 pounds. It was a remarkable day, one that will not be forgotten for a long time. It was once again a great day on the ice with Mark and other ice fishing friends enjoying the wonderful lakes and fish and Iowa. Iowa's Great Outdoors took some time to follow my good friend Keith and I to a farm pond in search of some January fish. It turned out to be a great 2 minute clip. 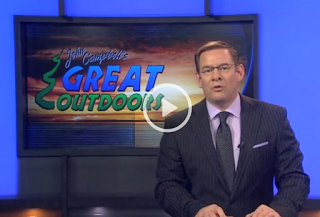 Once again, John Campbell did a fantastic job of bringing the outdoors to the folks of Iowa. A weekend spent at Okoboji is always a good time for several reasons. First, the morning scenery on this lake is like no other I have ever seen, the sun comes up over West Okoboji like a story book cover. Another of course, is the vast amount of species anglers can fish for at these lakes. I am pretty sure I could spend the entire month on this chain of lakes and not get bored of chasing down its many species. 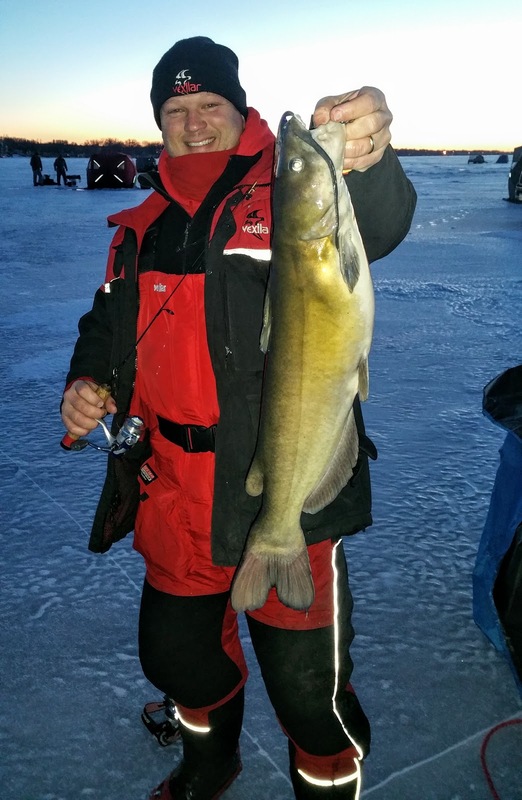 My travel companion and tournament partner Mark Anderson made the trip with me, and as always we had many laughs on the ice and many conversations about the fish and fishing locations we tried. During the time there, my buddy Mark or I caught the following species of fish: Bluegill, Walleye, Perch, Drum, Crappie, Northern Pike, Largemouth Bass, Yellow Bass, and Channel Catfish. Obviously, these lakes offer an endless array of fish to catch! Fishing is a life-long adventure, you just never know what you might learn at any given time to make you a better angler for the rest of your life. The best part of that is then sharing it with friends or my kids as they have taken a love for ice fishing as well. We schedule the trip because of a bluegill tournament that was held on Little Emerson Bay on Sunday. I have grown to love sight fishing big Okoboji Bluegills...but that was not the case this year. For some reason or another the bay has been cloudy all winter long and sight fishing was not part of the trip. We found a few areas that were holding nicer bluegills on Saturday and had a pretty good game plan of what we were going to do for the tournament on Sunday. Those big bluegills that attract anglers from neighboring states, they were nowhere to be found by any tournament competitor. 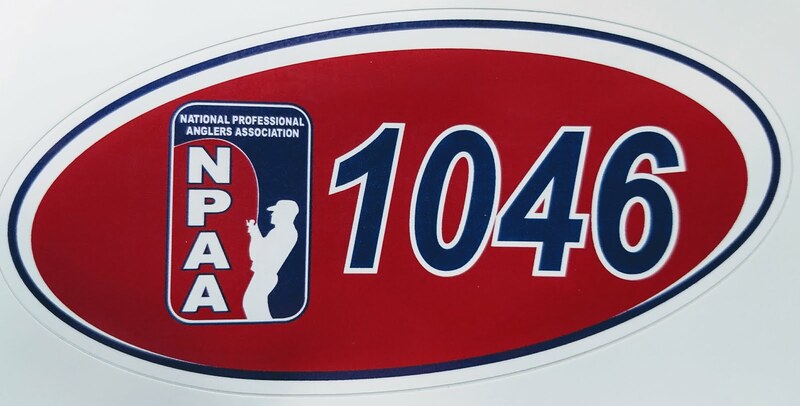 Of the 30 teams/60 anglers that fished the event a 0.74 pound bluegill was the largest fish. That is a great bluegill but doesn't compare to years past. We fell short of the competition this weekend, finishing in the middle of the pack, but many fish were caught and lessons were learned. Disappointed, yes, we both were but we will fight again another day. A big Congratulations to friends Chad Angell and Josh Sansgaard on another ice tournament victory!!! Another component of this trip was to try to fish for other species on the lakes. Saturday afternoon we took a short drive to East Okoboji to fish there. I have never iced fished there and was willing to take a look at it. We were hoping for some yellow bass and crappies. On this adventure a couple other friends joined in that were fishing the tournament as well. The four of us drilled a lot holes on the breaklines to discover no fish on the Vexilars. We continued looking and drilled out to the deeper basin, this is where the Vexilars started to light up. For the last 70-90 minutes of daylight the fishing action was great. 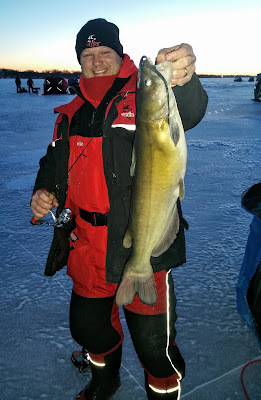 Big yellows, nice black crappies, a keeper walleye and my biggest fish ever through the ice, a catfish. It was quite a roller coaster those last few minutes of light, but we squeezed as much as we could into that day of fishing and we all enjoyed it very much. It is fun to fail, and then conquer the fish...even if it was for a brief amount of time. Lessons learned, experienced and remembered for another day on the ice.